Talk, talk, talk. 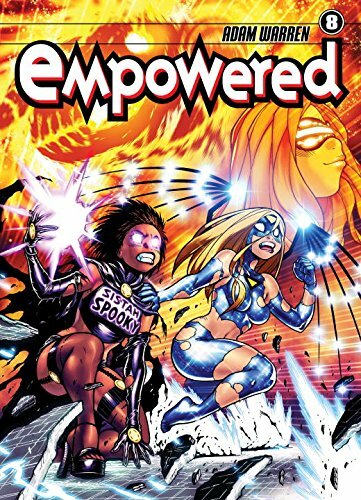 Empowered is traditionally wordy but this seeks to set new standards. Between the massive monologues, the bold, the underline and now parenthesis, this is getting hard on the brain, even before the thesauri-baiting. Thankfully it doesn’t last and the second half of the book goes back to the gooey, romantic and truly heroic feelings within us that Warren has a gift for tapping into. Sometimes heroes need saving and Emp understands that more than most. The artwork is still overusing the heavy blacks although these are now mostly used for environments. In a pinup comic you want to see fine lines and delicate shading, and you know from previous volumes Warren is good at it, so let’s hope we get to see more in future. It was a bit shaky at first but it is still a Thumbs Up!